On Nick and I’s honeymoon 7 years ago, we arrived in Paris after a week in London and headed out to explore. On the way back, after walking probably 10+ miles that day, we got incredibly lost. We were staying at a hotel in the Opera District of the city and the tiny narrow streets had us all turned around. With no data on our cell phones at that point, all we had was a paper map which didn’t help very much considering we didn’t even know where we were on said map. And so in my very limited French at that time, I stopped someone to ask for help. A lovely French man in a beret started pointing and going on and on in French which I followed none of and when he was done, I said “Merci,” and proceeded to look at Nick and said “I had absolutely no idea what he said.” In those situations when you just smile and go along because you don’t have the time or the energy to figure out what’s being said in another language or you truly don’t speak a word of whatever language you happen to find yourself in, can be excruciating while traveling. Those moments are when you find yourself on the verge of tears when you can’t understand, when you can’t communicate and when nothing you’re doing is actually getting through to the person speaking something else than you. It’s all part of travel though and while frustrating, doesn’t have to ruin your trip! Over the years, I’ve come up with a lot of ways around that frustrating feeling of not being able to communicate, no matter what language you might find yourself in. So when one of my longtime readers asked me for a post on this subject (thanks Jenn! 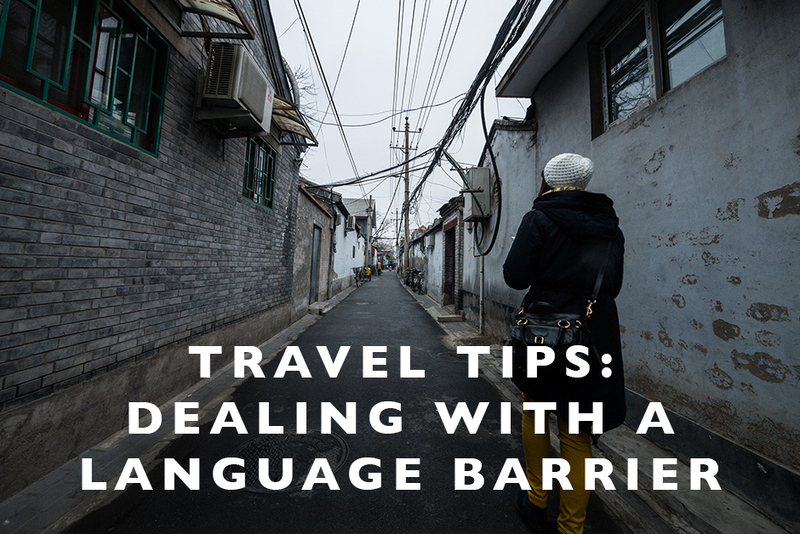 ), I jumped at the chance because language barriers don’t have to be horrible and don’t have to make you anxious or annoyed when you’re exploring other countries. Learn a few words of the local language before you leave. I almost always do this no matter where we go and it’s helped me tremendously in my travels around the world. Even if you only know how to say hello, goodbye and thank you, it means a lot to locals that you make an effort and they’ll be more willing to help you. Over time, as I visit certain places more and more, this rings more and more true. When I was traveling to Korea often for work, I learned a decent amount of Korean, at least the most common phrases to get by or take a taxi. I remember one morning I was walking from my favorite coffee shop to my office in Seoul and I was wandering past a shop keeper opening up for the day. I said “good morning” in Korean and he smiled at me warmly and said it back. It’s one of those moments that I always remember because it was my willingness to learn that allowed me to connect with a stranger that probably had 0 in common with myself. Don’t worry about perfect pronunciation or understanding in a foreign language. One thing I used to really worry about was pronouncing everything perfectly in another language when traveling even if I didn’t know the language at all. I would stress about “did I say that right! ?” or “I don’t want to sound rude!” But the truth is, when traveling, the locals know that you don’t speak their language and that’s totally ok. Of course we should all try to be respectful and pronounce everything as accurately as possible, but sometimes if you end up saying “mare-cay” the whole time in France when it should be pronounced “mare-see,” then at the end of the day, it’s not hurting anyone. As a visitor, obviously we don’t know the full language or meanings of everything in the local language, but that doesn’t mean we can’t still immerse ourselves and find beauty in where we are. And the locals are more thoughtful and kind than you think, like when the waiter we’d been going to everyday at our hotel restaurant in India quietly told me on our last day there with a smile after I’d been ordering “chai tea” every day for a week, “ma’am, you can actually just order chai, as chai tea is repeating the same word in Hindi.” Of course I was a little embarrassed in the moment, but his kindness and thoughtfulness to tell me that meant a lot to me. The locals want you to love their country, their home, so don’t worry so much about mistakes, instead try to focus on what you’re gaining from their country and their language, not what you’re missing. Have a map in English with you at all times. This rings true especially in places in the world where their alphabet is different than English, or your home language. For example in Asia, where languages are entirely different characters that I can’t read, it’s really important to have a map in English with you at all times. Buy one before you leave home so you don’t rely on what’s available on the ground wherever you are going. I was really glad to have an English map in China for example, as often times translations are bad there and might not say exactly the same things as one made in the US. While we all might speak thousands of different languages, one universal language is that of hand gestures. We can say a million different things to each other with just gestures and body language so embrace that when traveling. For example, a shrug of your shoulders and pointing on a map to where you want to go can ask a local where that is. When there really is no common language or words between you and someone else, this is your go-to to communicate with them in some way. Take a card from your hotel with address information. Especially in countries where English isn’t widely spoken, we always grab a card from our hotel that has the address of the hotel in the local language. This is usually a fail safe to use cabs and or ask directions to where you need to go no matter what language the locals speak that you don’t. Just ask your hotel front desk for one! When all else fails, just laugh it off and keep on walking. In Beijing last year we had walked 10+miles that day already all over the city and it was freezing cold and snowing and we were exhausted. So we hailed a cab, showed him the card from our hotel and he shook his head, waved us off and drove away. Baffled, we weren’t sure what happened so we hailed another cab. Same thing. We walked a bit more, hailed another one, same thing. We couldn’t figure out what was happening but realizing that no one was going to drive us the 10+ miles back, we just kept on walking until we got there. Upon returning to our hotel we asked the front desk what was going on with the taxis and they told us that Chinese taxi drivers are notorious for not wanting to drive very far so if they see where you are going and it’s outside of their radius of where they want to drive, they’ll tell you no. Well lesson learned, sometimes no matter what you do, a language barrier and not understanding what is happening will try to derail your trip. When you feel on the verge of tears from a language barrier, that’s when you have to just laugh it off and keep on walking. In the end, you’ll realize it’s not going to ruin anything, but it’s a lesson learned and a story you’ll have down the road to laugh about!